Book Nook Inn has assembled a directory of some great online stores that can help you fulfill many of your wedding or event needs at reasonable prices. You will find stores that sell wedding gowns, invitations, wedding favors, wedding gifts and much more. We hope our list can fulfill some of your needs and save you money. 1. Have your wedding and reception in the same location. This should go without saying, but one of the easiest ways to save money on your wedding venue is to have your wedding and reception in the same location. Not only will you only pay one rental fee, but you will also eliminate the transportation costs of getting you, your wedding party and your wedding guests to a second location. Book Nook Inn can provide a venue for both events. 2. Get married during the week. Saturday weddings are the most popular, so most venues charge more for this coveted day of the week. An easy way to cut costs on your wedding venue is to look at alternative days, such as Friday or Sunday. 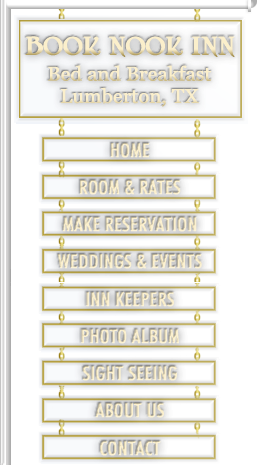 Book Nook Inn will give a 10% discount for weddings held on a day other than Saturday. Multiple sources for bridal dresses, bridal gowns, wedding gowns, bridesmaid dresses and mother of the bride dresses. Captivate your partner and the audience wearing one of the latest creations. Affordable, without compromising the quality and craftsmanship. Each gown is created with attention to detail throughout. Intricate beading, brilliant colors and award winning styles are what they offer. TopWedding is a global online wedding store , which offers bridal gowns, bridal party dresses, bridesmaid dresses, special occasion dresses, groom wear, bridal accessories, reception decorations and favors. Their wedding dresses and event dresses offer worldwide free shipping. Since TopWedding's beginning, it has provided thousands of brides and grooms with quality wedding apparels in reasonable prices. AmorModa. com is the global leading online retailer for wedding gowns, special event dresses, wedding party dresses, and accessories. Customers can browse the vast online selection and choose their favorite dresses with great satisfaction. AmorModa.com prides itself on exceptional customer service, high quality and affordable prices. Add some panache to your special day with our elegant wedding favors. These stylish favors bring sophistication and flair to any wedding. From delicate orchid gel candles to satin pillow sachets, romantic calla lilies to fine crystal flutes — there's an exquisitely designed favor made just for you. What better way to say thank you than with a little elegance and style! GiftTree is a gift company dedicated to making the gift giving experience simple and impressive. They take great pride in the quality of their foods, wines, containers and customer experience. They have recently been recognized as having the most satisfied customers in their industry and they are constantly looking for more opportunities to exceed your expectations. Save money on your wedding invitations by buying them on line. 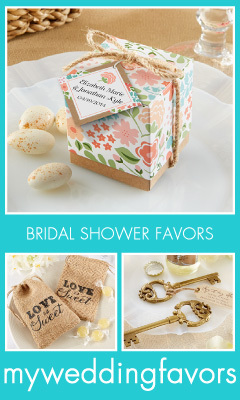 Encompassing every style from vintage to modern, you will find the most popular invites in the stores featured below. Many invites offer trendy patterns and color schemes, eloquent fonts and tasteful adornments like bows and floral designs. View in the stores below the many selections of invitations for your wedding.